Who doesn’t love a window seat? They’re so cute and cozy. They offer a chance for unabashed romance, comfort, sensuality and femininity – well, the good ones, anyway. They can be tucked out of the way, or play a prominent role in a room. 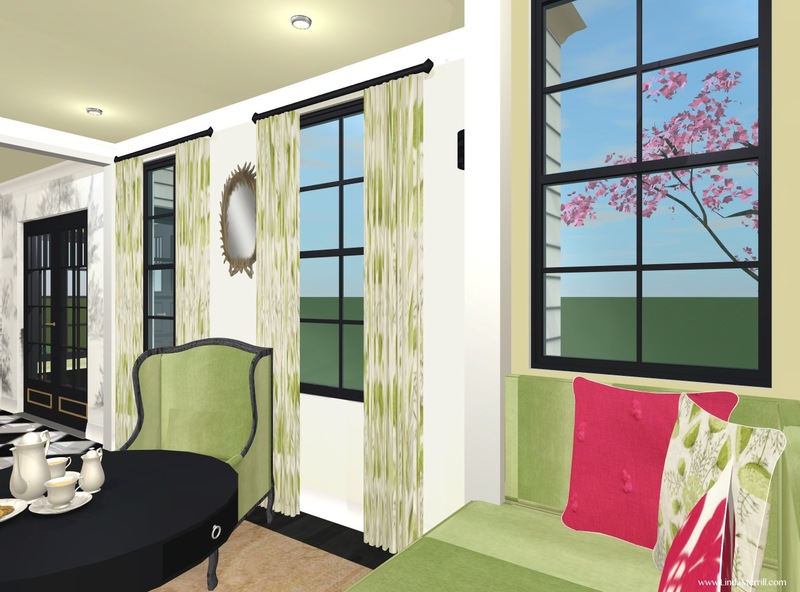 So, of course, my [virtual] Dream House has to have at lease one window seat. And so, I now have added a bay window bumpout to from the parlor on the left side of the house to accommodate a window seat. Okay, so my passion for green is long-lived and well documented. 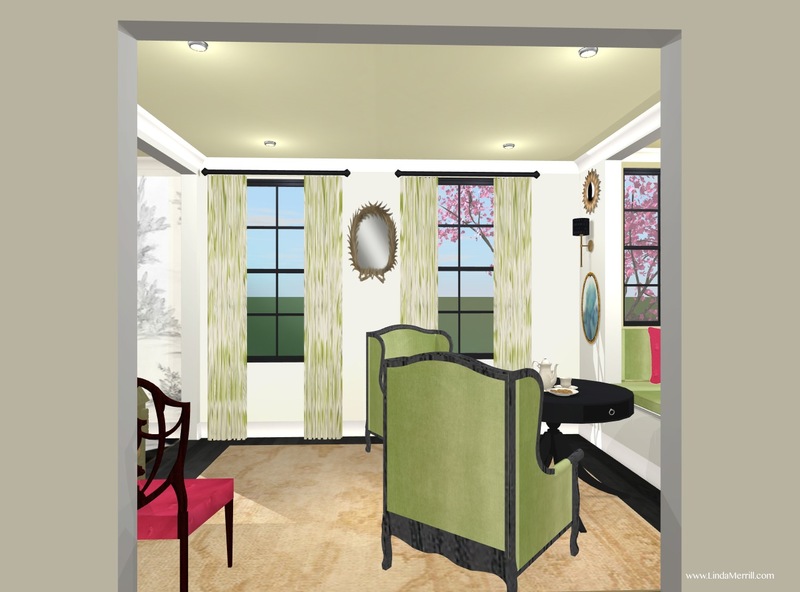 The front parlor in my “house” is actually quite small – 12’x10′. It’s truly meant to harken back to the era of these old New England houses with formal parlors where one greeted guests. I also love the idea of it being very “gardeny” in order to continue the “outside in” feeling from the green entry and muraled foyer. 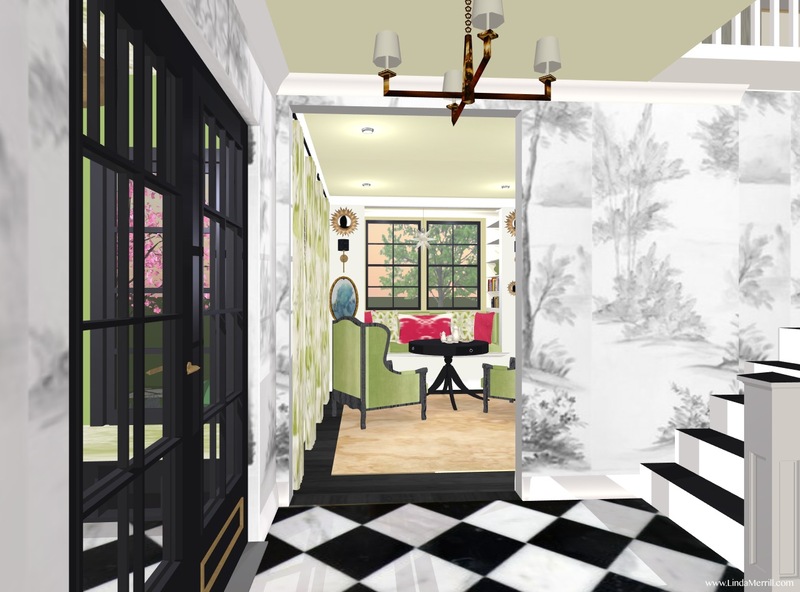 Okay, I know I shouldn’t be decorating before I’ve designed the entire house, but I just cannot help myself! But, pay little attention to what’s on the walls, just place holders for now. I’m not even sure of the paint color I’d want – this is Ben Moore’s White Dove with Castleton Mist on the ceiling and in the window seat. And the view from inside the window seat. 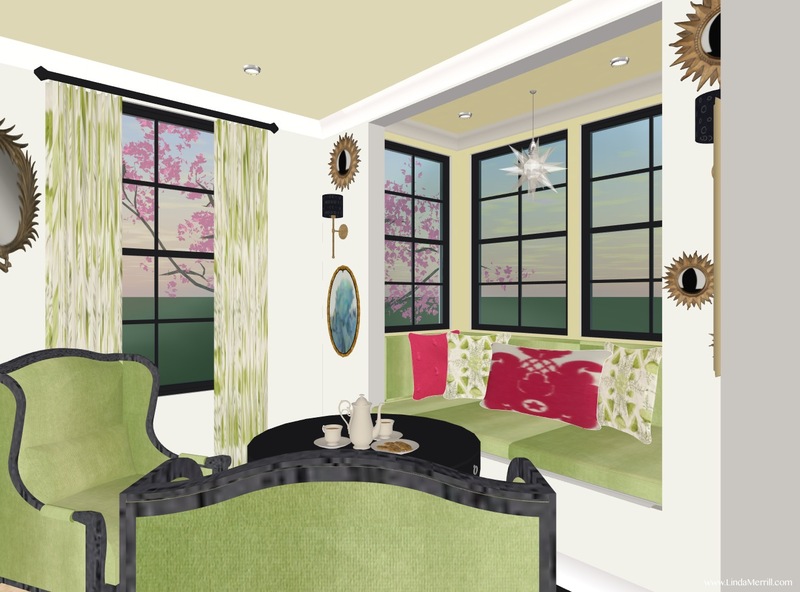 I envision a deep apple green velvet cushion and upholstered back walls (comfy!) with lots of pretty pillows. Speaking of pretty – how insanely gorgeous is Lauren Liess’ Queen Anne’s Bouquet fabric??? This would probably be the basis for my entire design of this room. It hits all the right buttons for me. It’s green (of course), feminine and it’s a pattern whose layout creates a larger symmetrical pattern – perfection. So, it’s now on some throw pillows and the window treatments. 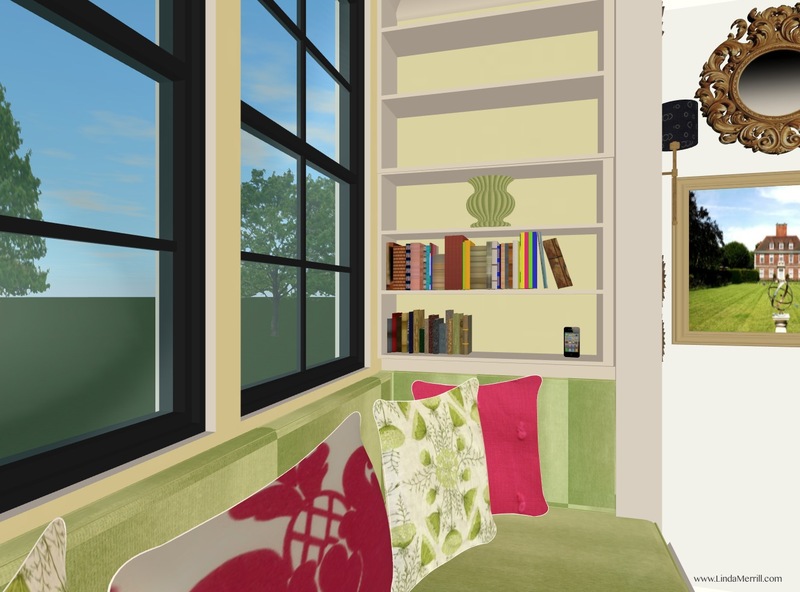 And as you can see – there is a handy little book shelf built into one of the side walls of the window seat. And looking back towards the front hall from the window seat perch. The little desk on the back wall represents my actual green desk – the beginnings of my “all green is good” world view. My father bought this little antique desk at a barn sale when I was in elementary school and refinished it for me. It would certainly have a place of honor in any home, including my dream house. There is also a matching display shelf that hangs above it. Here’s the view from the middle of the house looking forward into the parlor out the front windows. 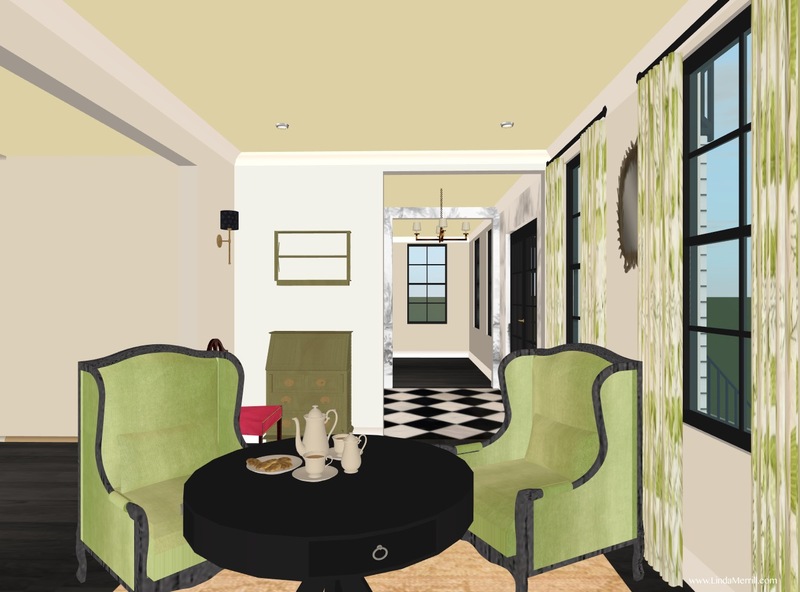 And another view – tea and cookies anyone? And here we’re looking back towards the rest of the house. 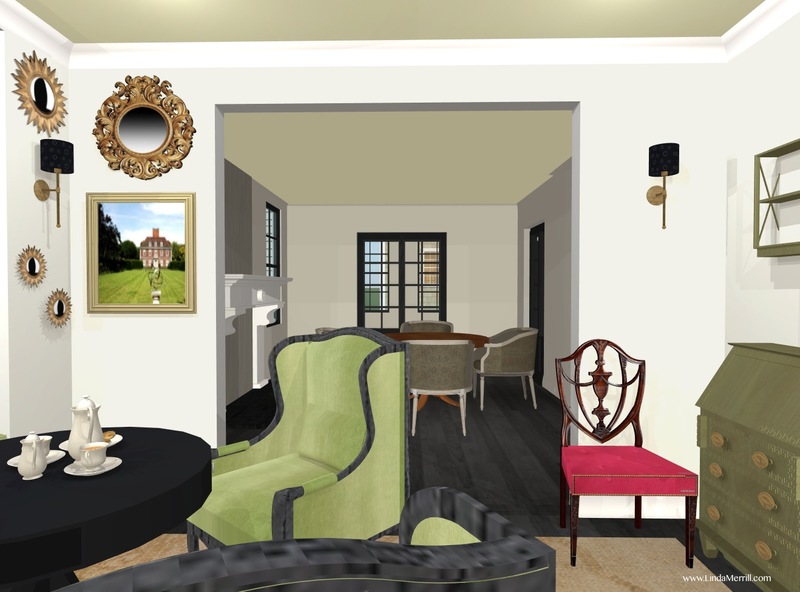 The middle room will be the library (envision lots of shelves and millwork), books and a beautiful table and chairs for more formal, but intimate, dinner parties, in front of the fireplace. And beyond that would be my home office which has its own entry from the side of the house. My thought is that I could meet with clients in the office, or in the library if we needed more space or were going to have coffee or a meal. 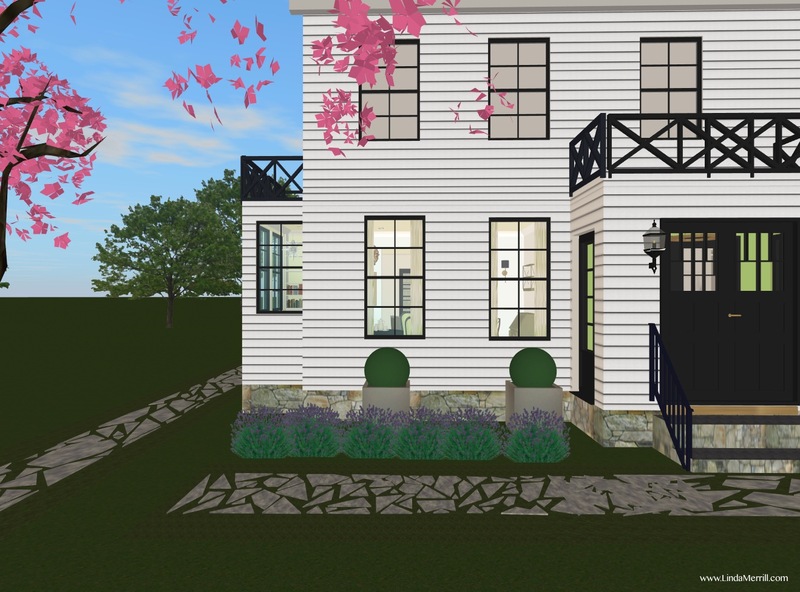 And here’s the exterior of the side of the house with the bay window in the front parlor and the matching bumpout for a nice private entry to the home office in the rear. 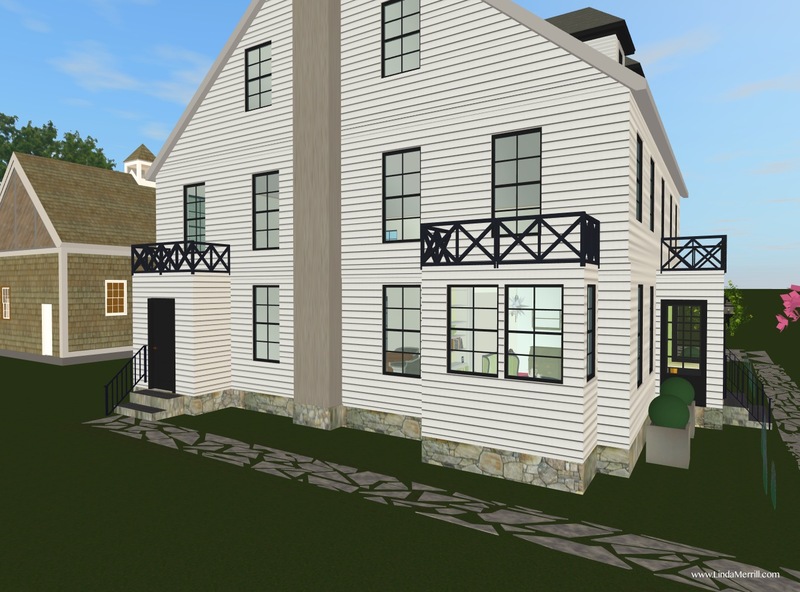 (Window placements in the second floor and attic are placeholders and subject to change). 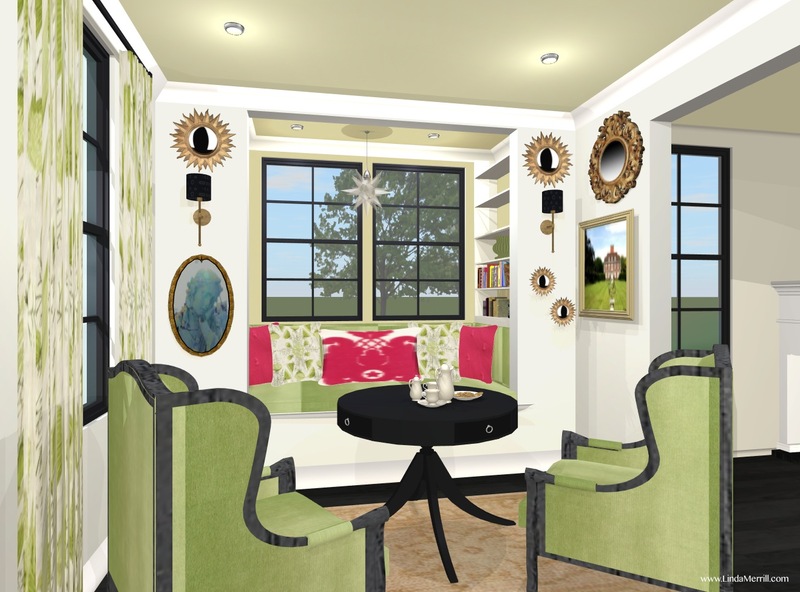 I hope you’re enjoying following along as I design my dream home as much as I am designing it. It may not be a reality at this moment, but it might be someday. And feel free to comment and make suggestions – there’s always something to learn.